My name is Renée van den Besselaar, and I joined the Ellie Cashman Design Team in June 2017 to help with Customer Relations. Shortly thereafter, Douglas Little of D.L. 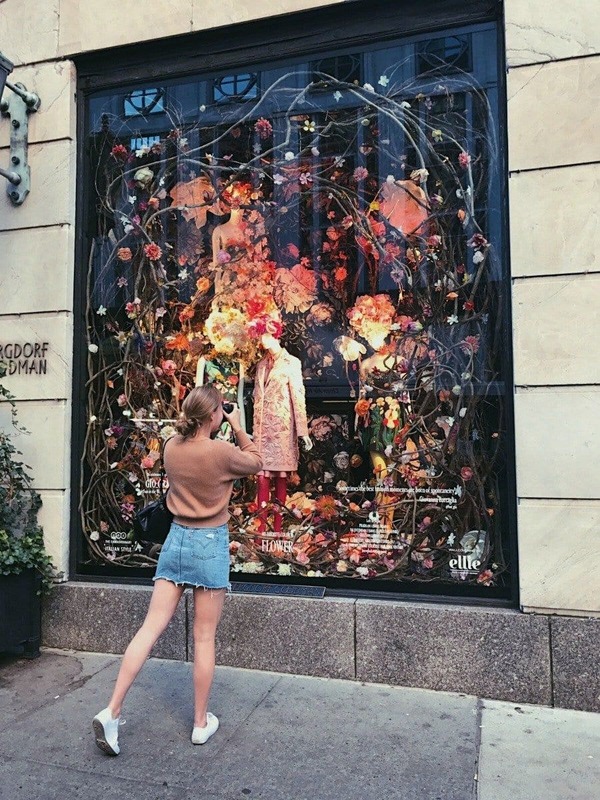 & Co. contacted us for a project that he was working on: a window display for Bergdorf Goodman in NYC (57th and 5th) during this year's NY Fashion Week. Douglas' idea was to use our Dark Floral II Black Saturated XL (200%) wallpaper as the backdrop for a floral-themed display. I helped him with his order, while at the same time, my family decided (for unrelated reasons) to take me with them on a late September trip to NYC. I had never been to New York before, so the trip was already pretty exciting. But it was an extra treat to learn that the window display would be extended past Fashion Week, and that I'd get to see it in real life! So, as soon as I arrived in New York, I headed over to 5th Avenue to check it out. 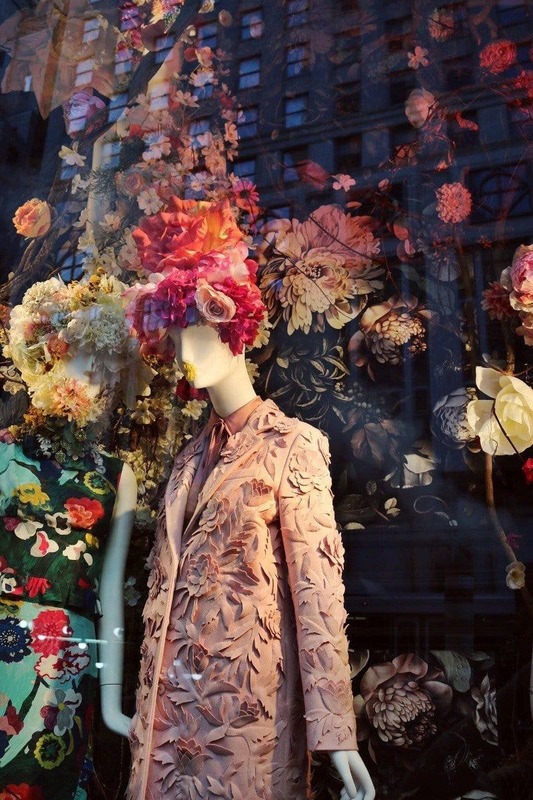 I spotted the window from a distance; it was a riot of florals! There were so many colors, textures, and the mannequins were all dressed in and surrounded by floral, floral and more floral! And there in the background was our Dark Floral II Black Saturated XL (200%) wallpaper, just as Douglas and I had discussed. The whole display was an absolute eye-catcher. For me, even 5th Avenue faded away for a few seconds. I was captivated by the power and optimism emanating from that window. It was the pure 'happiness' that it expressed. It gave me that 'spring feeling', that everything was new and full of potential. I felt surrounded by blossoming flowers, sunshine and joy. My father pulled me out of my reverie by taking pictures of me looking at the window. We weren't the only ones! 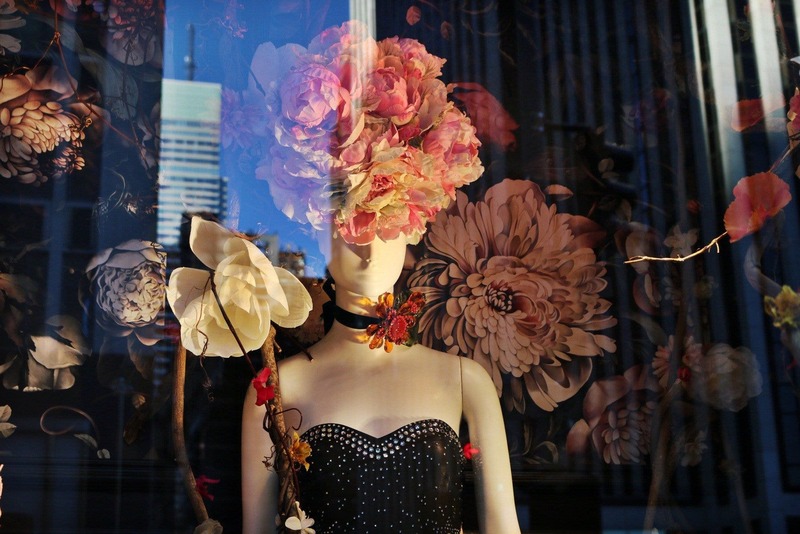 I noticed that many of the busy people walking by were surprised by, and suddenly drawn to, the floral fantasy world that was on display there at the corner of one of New York's busiest intersections. The warm colors and natural forms provided an inviting contrast to the city's concrete and steel. There was even a line of people that formed to take pictures (or have their pictures taken) in front of it. For me, it was inspiring to know that I was able to help Douglas achieve such a beautiful result, which was attracting the attention of so many. Hopefully, it made them feel the same optimism and joy that I did.